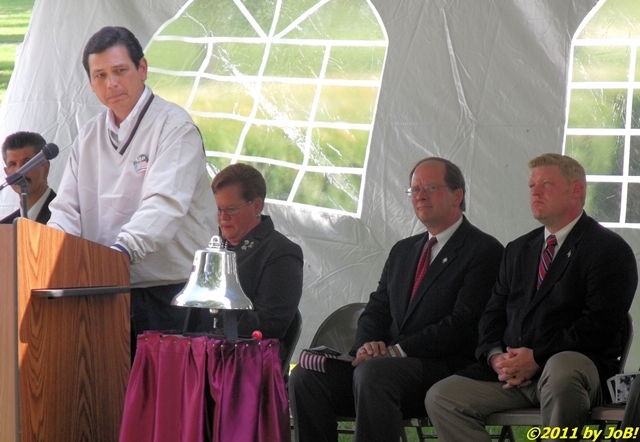 US Representative Steve Austria (standing) addresses the crowd during the remembrance program. Seated behind him are (from left to right) city councilman Frank Cervone, Mayor Joan Dautel, state senator Chris Widener, and state representative Jarrod Martin (R-Beavercreek). 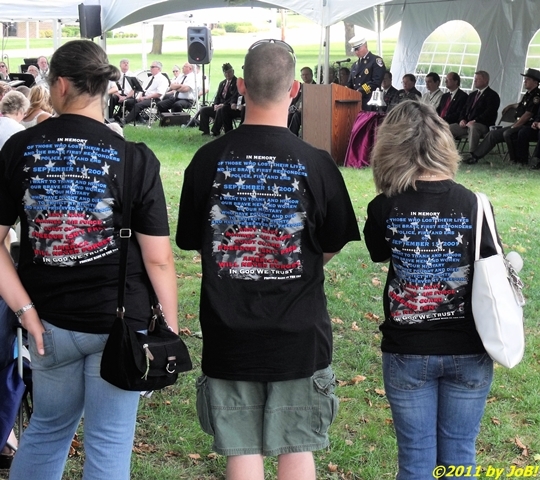 In Dautel’s initial comments, she reminded the crowd of Fairborn’s direct participation in the initial recovery efforts (several members of the city’s fire department dispatched to support Ohio rescue and recovery teams shortly after the September 2001 attacks). Representative Austria, who attended another 9/11 dedication event in neighboring Beavercreek earlier in the day, mentioned the complex challenges that were faced and those continued to be faced by local military personnel (his congressional district includes both Wright-Patterson and the Springfield Air National Guard base). During his speech, Senator Widener paid homage to two groups of people—the victims of the attacks and the military and civilian first responders who put everything at risk in the performance of their duties. 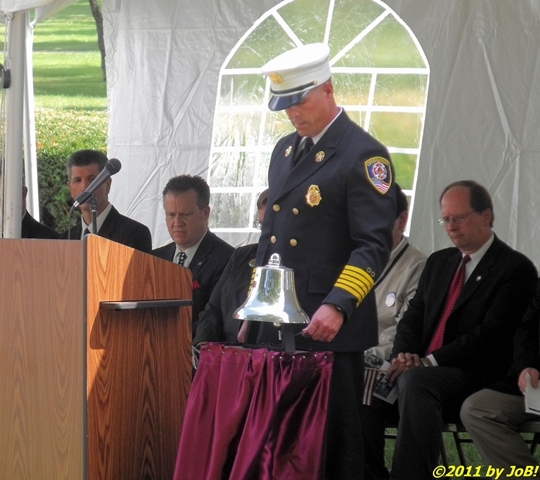 Fairborn Fire Chief Mike Riley performs the 'tolling of the bell' ceremony. The city’s fire chief, Chief Mike Riley, followed Widener and performed a ‘tolling of the bell’ ceremony that harkened back to a time in our nation’s history when the ringing of bells served as the primary means of communicating the loss of a firefighter within their communities. Jim Gruenberg, a former NYFD member and currently serving as the assistant director of the hosting center, next spoke on his personal activities at ‘Ground Zero’ which began less than 24 hours after the collapse of the buildings. In an emotional and very detailed account, he vividly described what he saw in his capacity as a liaison between the government’s Federal Emergency Management Agency and the city’s special operations personnel and, in closing, asked the crowd to preserve the message of September 11th. 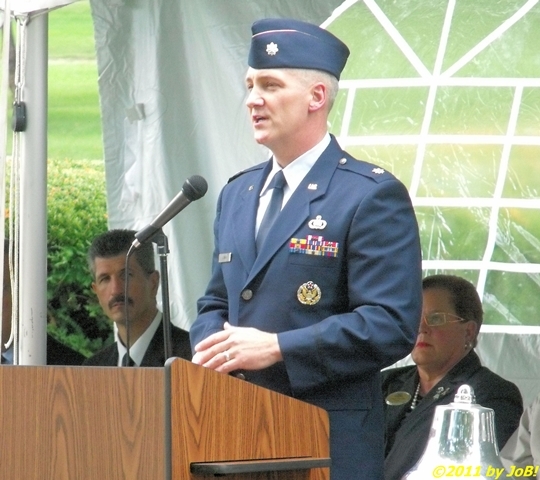 Air Force Reserve Lt. Col. Bruce Lyman shares his personal reflections of the attacks and his military and civilian efforts in the ensuing terrorism conflicts. As the event’s main guest speaker, Air Force Reserve Lt. Col. Bruce Lyman, who also serves as the chairman and chief executive officer of Enterprise Information Management Inc., a Dayton-area defense contractor with direct involvement with the military’s ongoing anti-terror efforts, shared a few personal anecdotes of his activities on the day of the attacks as well as his subsequent deployments to Iraq and Afghanistan. He highlighted one somber memory when the aircraft that the career Air Force intelligence officer was traveling in was retasked to transport the remains of a fallen US service member on the initial leg of their long journey back to their stateside hometown for burial. The casket was loaded in ceremonial fashion and the crew and passengers maintained silence for the duration of the trip in respect to their fallen comrade. 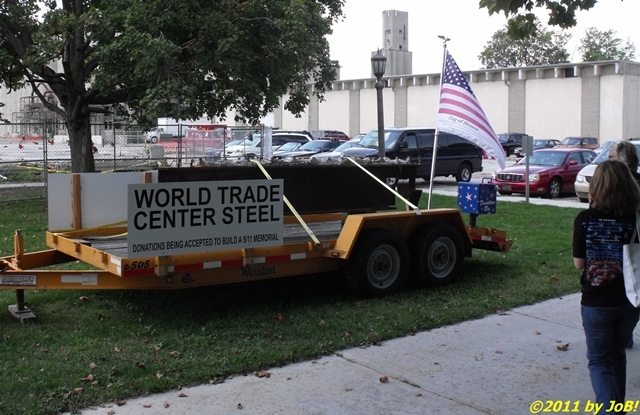 The centerpiece of the city's proposed 9-11 Monument is displayed for the public's view. This remembrance ceremony was the first to display a recently acquired World Trade Center artifact that will be incorporated into a planned permanent memorial at the Calamityville location. The last speaker, Battalion Chief Reichert, recalled the events surrounding his team’s retrieval of the 14-foot steel beam and its transportation to the southwest Ohio city earlier this year. With additional donations from the public to offset the memorial’s cost, he and the city’s 9-11 Monument Committee are hopeful that it would be completed in time for next year’s ceremony.